The administration of Mayor Bill de Blasio has steadily expanded the city’s interpretation of a state law that bars public disclosure of the personnel records of police officers, firefighters, and corrections officers. The issue reached a boiling point last year when the Police Department stopped providing disciplinary records to reporters at its headquarters, citing the statute, known by the clause 50-a. A state appellate court this year upheld the de Blasio administration’s assertion that 50-a applied to officers’ disciplinary records. On Wednesday, the administration’s application of the statute appeared to expand again, when a Police Department judge invoked 50-a to shield a retired officer, who was testifying as an expert witness in a departmental trial, from questions about his own disciplinary record. 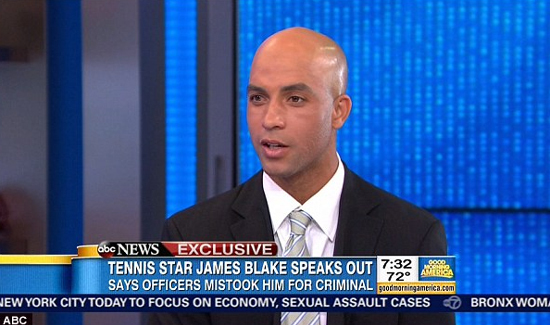 The former officer, Daniel Modell, was testifying on police use of force at a departmental hearing for Officer James Frascatore, who is being prosecuted by a civilian oversight agency on a charge that he used excessive force to take down James Blake, the retired tennis champion, in 2015. Deputy Commissioner Rosemarie Maldonado, who is overseeing the trial, initially cited 50-a to prevent a prosecutor from the Civilian Complaint Review Board, which investigates accusations of police abuse and misconduct, from asking Mr. Modell about his role in a ticket-fixing scheme in the Bronx. But Jonathan Fogel, the review board prosecutor handling the case, said in court that questions about Mr. Modell’s disciplinary record were important. After a break, Commissioner Maldonado said she would allow limited questions, but she closed the hearing room to the public, including reporters covering the trial. “It is my responsibility to balance my obligation to uphold section 50-a of the civil rights law with my obligation as a fact-finder” in the hearing, she said on Wednesday, explaining her decision. In January, Commissioner Maldonado allowed a Police Department prosecutor to ask Mr. Modell about his disciplinary history during Officer Richard Haste’s departmental trial in the fatal shooting of Ramarley Graham in 2012. It was not clear what prompted the change, or whether the appeals court ruling in March had played a role. The Police Department said in a statement late Wednesday that Commissioner Maldonado had “clearly explained” her actions. Commissioner Maldonado’s decision added another layer of secrecy to the process. Although the public can attend disciplinary trials, the judge’s findings and the police commissioner’s ultimate decision on punishment are rarely disclosed, and only at officials’ discretion. The 50-a statute is routinely invoked to protect officers’ disciplinary records from scrutiny in civil and criminal cases in state and federal courts.